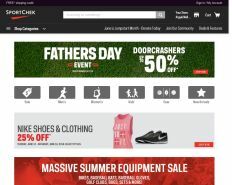 Sport Chek is a quality name brand with a focus in retail sporting footwear, apparel and equipment. Famous brand names include Reebok and Timberland. Sport Check also famously supports the Canadian amateur athletic association to promote healthy sports. Get 20% Off Snowshoes on In-store ticket price select brands & styles. Includes Mckinley, Atlas, Louis Garneau, Tubbs. Get 30% Off Men’s & Women’s Winter Jackets & Pants on Select brands & styles. Includes The North Face, Burton, Roxy, Woods. Get Up To 60% Off Alpine Ski & Snowboard Equipment on select regular price brands & styles. Includes K2, Rossignol, Dalbello & More. Get 30% off Men’s & women’s hoodies, tops & tees on in-store ticket price Select brands & styles. Includes Columbia, Mountain Hardwear, Woods & more. Get Up to 40% Off select Men’s, Women’s & Kids’ Ripzone Clothing Clearance + Additional 25% Off Clearance Price. Ends on 01/17/2018 AT 01:59 AM ET. Get 30% Off Select brands Men’s, Women’s & Kids’ Winter Boots. Ends on 01/17/2019 AT 01:59 AM ET. Get up to $15 shipping credit when you spend $100 or more. Offer applies to select items for delivery by standard shipping only. Visit site for details. Get 30% Off Men’S, Women’S & Kids’ Winter Accessories & Baselayer on select brands & styles. Includes Ripzone, The North Face, Burton & more. Get Up to $60 off Men’s & Women’s Trend shoes & winter boots on Select Regular price brands & styles. Including DC, MCKINLEY, MERRELL.